Have you ever wondered what the full form of Wi-Fi is? Do you know how does the most common thing around the house or office, that is, Wi-Fi works? In the following article we shall discuss what is Wi-Fi and how does it work. Wi-Fi is an acronym for the term Wireless Fidelity. It is a technology that uses radio waves to help a network be connected to the Internet. It was developed to replace the Ethernet cable that usually helps computers connect to the Internet. This was after the dial-up connection become a passé. So, Wi-Fi is a way to broadcast Internet without the help of wires. You can connect many computers, laptops, smartphones as well as other devices that require Internet with the help of a Wi-Fi. You don’t need extra cables and wires or extra phone lines, just a wireless router will suffice. Wi-Fi uses radio frequencies to send the signals between different devices. These radio signals are nothing like your walky talkie or weather radio signals. The Wi-Fi transmits and receives these signals in the Gigahertz range. The frequency at which Wi-Fi waves travels is around 2.5Ghz and 5Ghz. These frequencies are similar to the frequencies of the microwave. Wi-Fi just like a mobile phone uses radio waves to transmit data as we have discussed in the preceding paragraph. The computer needs to be connected to a wireless adapter that can convert data into a radio signal. This signal is then transmitted with the help of an antenna to a decoder. This decoder is called as the wireless router. The wireless router will decode the signal and send the information to the Internet via a wired Ethernet connection. The Wi-Fi network is a two-way traffic. It can transmit data to the Internet as well as receive data from the Internet. The wireless network can transmit data at a frequency level of 2.4 GHZ or 5GHz. The 802.11a networking standard can transmit data at a frequency of 5GHz. The 802.11b can transmit data at frequency level of 2.4GHz, a very slow speed. This means you can transmit just 11 megabits of data/second. The 802.11g transmit data at 2.4GHz, but also transmit at maximum 54 megabits of data/per second. The most advanced of all networking standards is the 802.11n that can transmit at a maximum of 140 megabits data/per second. 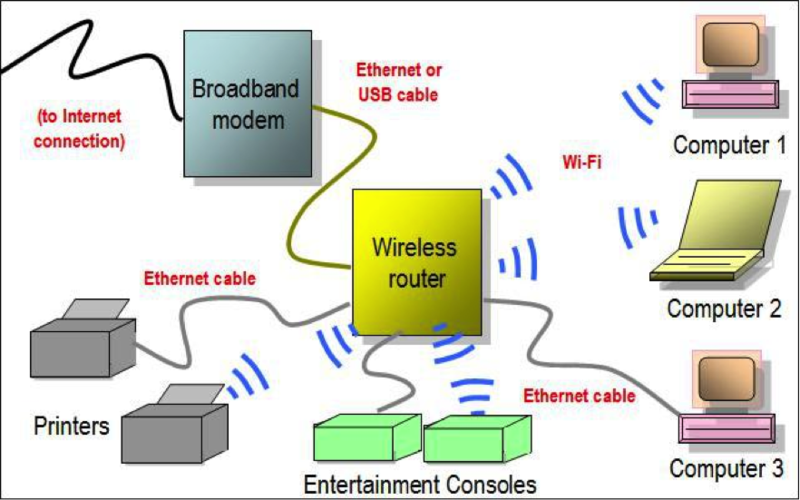 In order to setup a Wi-Fi connection, you need a wireless transmitter called as the wireless access point (WAP) and a Wi-Fi adapter on every device that needs to be connected to the Wi-Fi network. Most Internet Service Providers today supply users with a router, modem and a wireless transmitter in one device. This all-in-one device is called a router. The router just needs an electricity outlet for powering up and needs to be plugged into a phone socket. Many broadband Internet connections just require an adapter to be connected with the router using an Ethernet cable. Most devices today have a built-in Wi-Fi receiver and thus, are Wi-Fi ready. All you need is to setup the router and adapter and connect your device to your Wi-Fi network. This is all about what is Wi-Fi and how does it work. Wi-Fi is the simplest way to connect multiple devices to the Internet. Hi dear I want connect all of u but how I added all of u whatsapp & video chat & others chtting any apps not working proper so u r all try to connect to me.thanx all of u.